Swindon Borough Council is obliged to carry out a review of our Local Plan to ensure sufficient ‘deliverable’ housing and employment sites are available in the plan period. In accordance with Government requirements Swindon Borough Council is undertaking a Strategic Housing and Economic Land Availability Assessment (SHELAA) to identify potential sites and assess whether such sites are deliverable or developable for housing, employment or other economic uses. 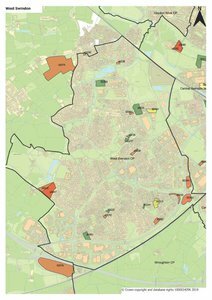 The SHELAA is part of the technical evidence base to help inform the preparation of the Local Plan Review and can also be used by those parishes producing Neighbourhood Plans. The SHELAA only identifies sites with potential for future development. It does not allocate sites to be developed. The allocation of sites for future development will take place in the Local Plan review or in any locally produced Neighbourhood Plans. Nor does the identification of potential development sites within the SHELAA imply that the Council would necessarily grant planning permission for development. All applications will continue to be considered against national policies, the Council’s Development Plan and any other relevant material considerations.